The Revenge of Pipe Ooze! is a comic that was released by Valiant Comics imprint Nintendo Comics System. It was printed in Adventures of the Super Mario Bros. No. 7 and again in the Super Mario Bros.: Meet the Koopa Kids trade paperback. Before entering the Warp Tube to the convention, the king asks what it is they are supposed to be doing, prompting his daughter to remind him that they are pretending to be characters from Mario's favorite comic, and they are (according to Mario) going to act out Dirk Drain-Head Issue #287: "Hot and Cold Running Brains". After Mario compliments Toad's costume while jumping into the Warp Tube, he tells the group that everyone is going to be so jealous of his perfect costume, and Luigi's "adequate" one. After Mario says this will be the best day of his life, Toad's non-sequitur response is that wallowing in slime makes him hungry, sentiments the king agrees with. Finally reaching the convention, which is filled with celebrating Mushroom People, Koopa Troopas, and Piranha Plants, Mario begins soaking in all the non-existent praise his costume is getting (when a Mushroomer asks who Mario is supposed to be, his friend guesses its someone cosplaying as Dirk in Issue #16, in which Dirk was "hit by a ray that made him short and dumpy"). While Luigi voices distaste over his costume ("Why does the character Snakey have to wear socks instead of shoes like normal people?!") the king loudly asks where he can get something to eat. Elsewhere, Bowser has Lemmy push an Apook Corporation hotdog stand near a Question Block, believing it is the perfect place for Lemmy's ambush test ("Ah, I remember my ambush test. To catch someone unprepared, beat the chicken soup out of them and run away...") Noticing the convention nearby, Lemmy mentions he loves Dirk Drain-Head, and asks if he can have some time to look around later. After guzzling some Koopa Kola, Bowser throws the empty can at Lemmy's head, and nonchalantly answers with "I don't know. Why do you ask me these questions?" Lemmy's response is simply "I'm sorry daddy. I'm a bad son." While looking for a snack with Toad in tow, King Toadstool finds Bowser's hotdog stand, and when Toad tells him they have to hurry, the king dismisses his concern, telling him "there's always time for a slime burger and mold shake!!" Before Toad or the king can react, Bowser and Lemmy (who had disguised themselves using only fake moustaches) knock the two out with magic wands. After complimenting Lemmy's technique, Bowser tells him they now have to steal the downed Toad and king's costumes. As Mario puts on a show for an audience of Mushroom People, Luigi mentions this entire thing is getting on his nerves, but is reassured by Princess Toadstool, who says Mario never asks for much, and that this is important to him, so they should just play along and try to have fun. Coming across a pair of female Piranha Plants, Mario notices one is dressed as Dirk's pal Rusty Water, and compliments her, as the princess says its worth wearing stupid outfits to see Mario so happy (which Luigi reluctantly agrees with). 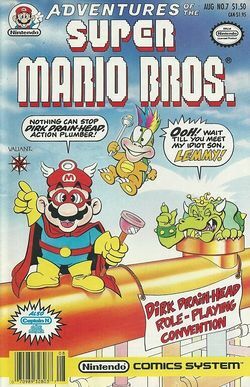 As the Piranha Plant mentions Mario and Luigi should switch costumes, Bowser, wearing the king's Pipe Ooze outfit, tells Lemmy (dressed as Muck) to pick someone they can ambush, so Lemmy suggests Mario. Below the crowd, Bowser launches Lemmy into the air using a catapult, and as his son prepares to attack Mario, muses the Koopaling just does not seem to be taking to his "evil villain lessons" (initially ignoring a Piranha Plant that recognizes them as King Koopa, and "that idiot, Lemmy"). Lemmy's ambush fails when he slams headfirst into a pipe, and he falls as Bowser begins throttling the Piranha Plant for insulting "my idiot son". Grabbing Lemmy after attacking the Piranha Plant, Bowser decides to teach by example, and leaps onto the pipe Mario, Luigi and the crowd are on. Mistaken for King Toadstool by Luigi, Bowser orders Lemmy to attack, but the Koopaling hesitates, asking if he can roleplay a little "before I splatter Mario into the landscape". Losing patience with Lemmy, Bowser yells at him, rhetorically asking what could be more fun than an unprovoked attack. Lemmy answers with a meek "Nothing daddy. You're right. I guess." before storming off. Feeling sorry about losing his temper, Bowser grabs Lemmy and gives him two minutes to play, causing Lemmy to become ecstatic. Nearby, Mario is sulking, annoyed and jealous that Luigi is Dirk's exact double, while he looks nothing like him. When Luigi asks Mario if he wants to roleplay, Lemmy approaches the two, telling them that if they really are acting out Issue #287, then he should be on their side, since in the comic, Muck had lost his memory and joined Dirk (Mario is less than amused by this, saying he now has nothing to do, since Muck replaced Snakey as Dirk's sidekick in the story). Running up to his father (who is wondering what harm could come out of letting the Koopaling have a little fun) Lemmy punches him in the back of the head. As Lemmy kicks and bludgeons his father with a wrench, Luigi finally realizes Pipe Ooze is really Bowser, and Muck is Lemmy. As Lemmy continues to pummel his father, Mario wanders off, still depressed and wanting to be alone ("I think I'll go into the corner and make strangers feel uncomfortable. I'm not needed.") When Lemmy finishes beating up Bowser, Luigi approaches the dazed Koopa King, telling him he knows he is not King Toadstool, despite Bowser claiming otherwise ("You're mistaken. I'm King Toadstool. Wanna see me do something stupid and prove it?") Luigi tells Bowser that Mario feels like a failure, and that he is going to pretend to be afraid of him to make him feel better. When Bowser asks why he should do that, Luigi tells him that he is unarmed, and surrounded by thousands of Mushroomers he has mistreated over the years. Reluctantly obliging to Luigi's request, Bowser makes a feeble attempt at acting cowardly in front of Mario, who, feeling reenergized, attacks the Koopa King by jumping on him. Whipped into a frenzy by Mario's display, a crowd of Mushroom People and Piranha Plants surround him, asking for autographs. As the crowd hoists Mario into the air, Luigi throws him the Dirk Drain-Head outfit, telling him he is more like Dirk than he could ever be. A few seconds later, King Toadstool and Toad, sporting visible bumps, show up, and mention they feel terrible. Princess Toadstool appears, and guesses the two feel sick because they ate too many Apook Burger World Lard Fries. Ditching their stolen costumes, Bowser and Lemmy sneak away. As Bowser nurses his wounds, Lemmy asks him if he failed his ambush test. Bowser says he probably did, unless attacking your own father counts. When Lemmy asks if it does, Bowser confirms it does, and says the Koopaling even gets extra credit for attacking a close family member. Telling Lemmy he is proud of him, Bowser decides to take him out for some Apook Burgers and Lard Fries, as they both deserve a break after what transpired today. This page was last edited on February 3, 2018, at 09:22.